These photos show the continuing progress on the construction of Student Services Building Addition. 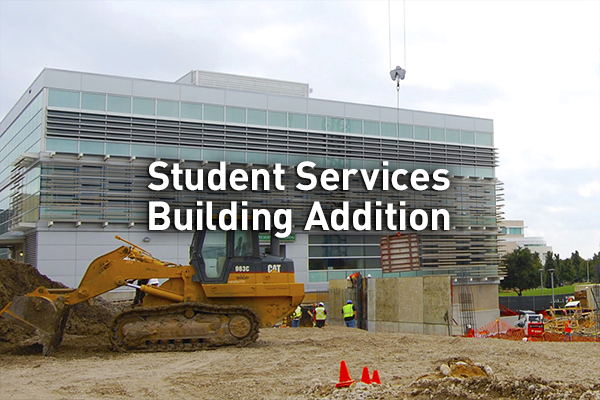 In the seven years since the construction of the original Student Services Building, University enrollment grew by nearly 10,000 students. This 68,000 square foot addition will allow Student Affairs to collect all of its services into one area of campus, and bring much-needed additional space for studying, offices, meetings, and events. Student input was key to its design, which will include a 534-seat auditorium, locations for food vendors, and a recreation area for pool tables, ping-pong tables, and a gaming wall.